David is addicted to a certain chocolate milk. We first stumbled on it at Starbucks (they sell it in their refrigerated case), but then we found the half-gallon size at Target. I even drink the milk, that’s how good it is. 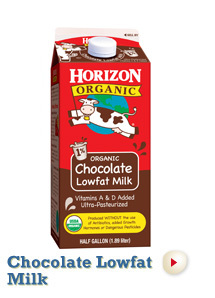 5 Minutes for Mom is hosting a contest to win $300 of FREE Horizon Organic products. I’ve never won a contest in my life, but this would be a dream prize for me, as sad as that sounds! lol.